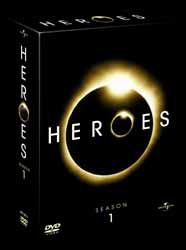 Heroes was an almost overnight success and it's not hard to see why. The show follows a group of normal people from around the world who suddenly discover that they've got unusual super powers. None of these powers are duplicated amongst those that have them. Some of the powers are welcomed by their owners, but not all of them. As the series progresses, we discover that there are more and more people showing signs of these powers and it becomes apparent that each of them has, somewhere on their person, one of two distinct marks. What can these marks mean? Do they belong to two different groups? Is Armageddon about to be fought on earth? Mohinder Suresh: An Indian genetics professor who travels to New York in a bid to complete his father's research and uncover the secret he died protecting. Suresh has no powers. Peter Petrelli: A young male nurse desperate to convince his politician brother, Nathan Petrelli that he can fly. Peter is convinced that saving a young cheerleader is the key to preventing his nightmares becoming reality. Claire Bennet: A high school cheerleader who discovers she is completely indestructible and has an adoptive father who is being very secretive about his job at the mysterious 'Prima Tech Paper Company'. Niki Sanders: A Las Vegas stripper struggling to make ends meet to support her young son Micah and who is troubled by her reflection in the mirror, which has a mind of its own and holds a dark secret. Matt Parkman: A Los Angeles cop who realises he can hear people's thoughts. This puts him on the trail of an elusive serial killer named Sylar but also makes him a prime suspect in the murder case. Isaac Mendez: A gifted artist whose drug induced paintings, predict the future. This includes nightmare visions of the brutal murder of a cheerleader, a flying man, and the obliteration of New York City. While the first half of Season 1 (or "volume 1" as the series likes to call itself) is about getting to know the main characters and the fact that there are a lot of humans out there with mysterious super powers, the second half is basically the countdown to the season cliff-hanger. I was surprised to see how shallow the storyline for the second half of the series actually is if you strip it down. Basically, and this isn't spoiling anything, we are building towards a single, catastrophic event that will take place in New York City - effecting the entire planet. And, in a nutshell, that's it. The entire second half of Season One slowly limps its way to this big show down (which happens rather quickly in the last 10 minutes of the last episode, I might add). Sure all the suspense and excitement of getting there is wonderfully built, and to be honest Kring is a genius. He's built up so many regular characters with so many twists and turns that you never actually question the main narrative. So a simple event, that on any other show (say The X-Files, or Buffy for example) would have been over in a two-part episode at a push, can carefully be stretched over 23 episodes without it feeling like we are being cheated out of any real story. Thread in-between this a lot of little mini-stories to keep the audience from seeing where you're going, and there you have it: Kring's masterpiece banged to rights. Sounds like I hate the show, far from it - I loved every second of it. I even enjoyed the rather clichéd season ender - yes even the bit with the manhole cover. The show does offer something new to the sci-fi genre; it does have fantastic actors; it does have incredibly high production values; and it is a joy to watch. There are some incredible guest stars in the second half of the season, including George Takei, Christopher Eccleston (who plays an invisible man who is an Obi-Wan Kenobi like character), Eric Roberts, Stan Lee, an almost unrecognisable Ellen Greene (Little Shop of Horrors) plays Sylar's mother, and Malcolm McDowell. There are more than a few surprises too for a lot of the main characters. The great thing about having so many main characters is that it's not hard to simply kill off several as you go. I suppose it stops the actors from demanding more money as the show goes on - as they know that they are dispensable - but it also gives genuine jeopardy to the events that unfold. You have no idea if any of the characters will die at any moment and that really gives this show a serious edge that you just don't get in TV programmes these days. Extras include the unaired pilot (which is not really that different from the finished show - there are a couple of terrorist plot threads which were dropped; Greg Grunberg's Matt Parkman is introduced a lot earlier; Sylar is revealed; and Isaac loses his hand) with optional audio commentary with Kring; deleted scenes; audio commentaries with cast and crew on all of the last 23 episodes; Making of featurette (10 mins); Special Effects featurette (9 mins); Profile of Artist Tim Sale (11 minute interview with Tim Sale, who provides all of Isaac's paintings - although he doesn't colourise them as he admits to being colour-blind) The Stunts (10 minute interview with stunt coordinator, Ian Quinn, which looks at a couple of the stunts in the show); and The Score (9 mins look at the use of music in the series. Includes interviews with composers Wendy Melvoin and Lisa Coleman and audio engineer, Michael Perfitt). While the episodes themselves are worthy of a finished mark of 10/10, the fact that Universal Pictures are blatantly trying to squeeze as much cash out of fans of the show as is possible is almost criminal. The Region 1 DVD (that's the American format if you weren't aware) is available for $60 (around £30) and you get the exact same extras. In this day and age, where almost everyone owns a multi-region DVD player you've got to ask yourself why UK consumers are having to pay more than our American cousins. Fantastic show, great episode, rip-off UK retail price. You're better advised to buy the entire season box set, or better still you might be better off purchasing the American box set from Amazon.com.